Yes friends and neighbors, it is Monday. I'm making a list of 5 things I'm motivated to do this week. 1. Exercise 4x this week. After last week's viral plague, I feel the need to get moving. 2. Spend some QT with my husband. I feel like I haven't seen him in ages. 3. Enjoy a glass of wine. It's been too long. 4. Start doing daily couple's devotional again. We always seem to be too busy, but it's so important to our marriage to seek God together. 5. 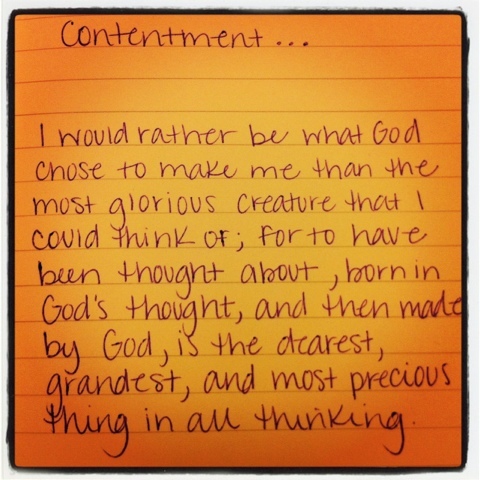 Be content. I read the below statement last week, and it really got me thinking about how important it is to know we are purposeful beings. God didn't create us by accident; we should learn to be content with who he made us to be.